This article try to find a best Internet browser with different criteria. This is a common question in the Internet world, because everyone require best browser for their Internet purposes. 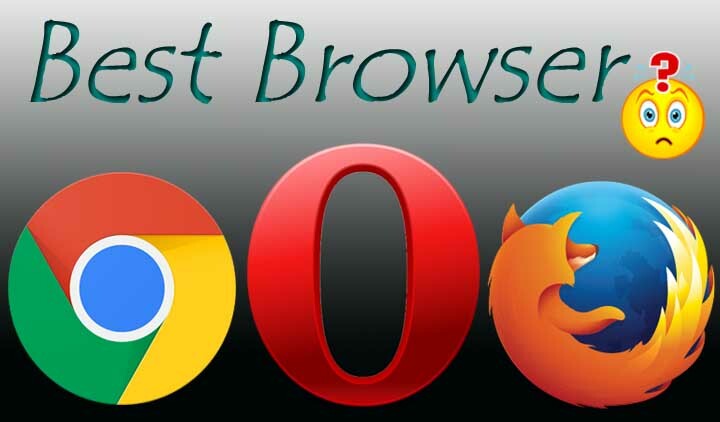 Choosing a best browser is not easy because the criteria for electing a best browser lie on many factors. These are the main criteria for a best browser. When I was a student, one of my classmates elected opera for his browsing purpose even almost others were surfing with Google Chrome. When I asked the reason then the security was his reason for his chosen. Recently I heard a news of cookie stealing from thousands of browsers and opera is not listed on their list of such hacked browsers. While we considering the speed of the browser, I give mark for major three browsers. In case of fastest browser in the world with considering all others browsers, I have already written an article for finding the fastest browser in the world, that considers only browsing speed. I have not studied the security of the data. Google always welcome hackers to hack their browser chrome with big offer. That means Google demand that their browser Chrome is so secure. Note only the Google Chrome but also Firefox and Opera are still demand that their browsers are too secure. Compatibility includes compatible and responsive view support for different websites and add-on availability. Most web developers request to use Mozilla Firefox for best compatible view for their websites. In case of Add-on availability, Mozilla has thousands of add-ons for different purposes. Chrome also supports many add-on and extensions but opera provide less third party supports. The conclusion depends you because the criteria for choosing a best browser depends you. In my case, I choose Opera as my primary browser but I also use Chrome, Firefox, Internet Explorer and Microsoft Edge for different purposes and different account login. In my Android smart phone, I use Only Chrome, which is enough to me for a better performance. UC browser, Opera Mini are also perform well with mobile devices.